In this particular case, I was at the library browsing through the small selection of back issues of delicious. magazine. That’s when I saw it. A photo on the cover of November 2009’s issue that looked like a stack of Heaven with Heaven sauce and Heaven cream and a scattering of Heaven thrown on top. I clutched on to it immediately. What was actually on the cover was a beautifully arranged stack of 3 coconut pancakes. In between the layers was a hearty creamy dollop of creme fraiche and sliced bananas. 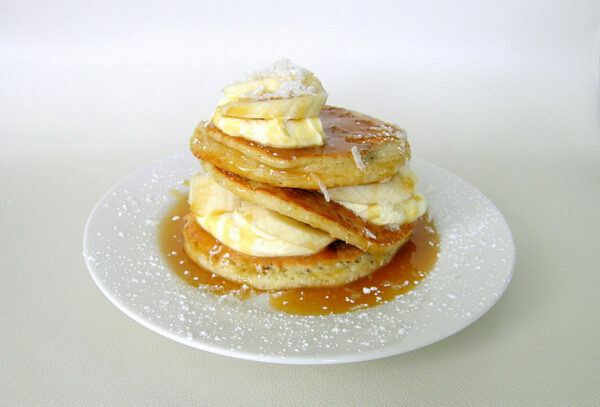 From the very top of the stack of pancakes, caramel sauce drizzled down and scattered about the stack was shredded coconut and a dusting of icing sugar. Oh. My. God. The photo looked fantastic. And then, I made it for myself. My stack looks sort of similar to the photo on the cover, but it doesn’t have the elegance that the cover photo did! But in the end, it didn’t matter to me one single bit what it looked like, because this is one of the most delicious stacks of pancakes I have ever eaten. Ever. Let’s start with the caramel sauce. It is drop-dead easy to make – just throw the ingredients into a saucepan and simmer for a few minutes. And it’s super sweet. But that’s okay, because the tang from the creme fraiche balances everything out perfectly. What you’ll find most time-consuming is that the eggs for the pancakes are separated. The yolks are whisked along with the regular ingredients (milk, flour, baking powder, etc.) and the whites are whisked to stiff peaks then gently folded into the batter. I used my stand mixer to do that because I don’t have the patience to do it by hand (unlike Jonathan on MasterChef Australia, have you seen that guy whisk egg whites? Wow, he’s like a human KitchenAid!). Anyway, you’ll get about 9 pancakes. Divide them up into groups of three, layer with a dollop of creme fraiche and sliced bananas, give the caramel sauce a stir, then drizzle over the pancakes. Lastly, dust the whole plate with icing sugar and sprinkle with shredded coconut. And there you have it, one of the most divine, heavenly, indulgent dishes you could ever have the pleasure of eating. My pictures just don’t do it justice, really. Just a quick tip – I had to whisk my creme fraiche to get it all nice and creamy, otherwise it was firm, like a block of tofu. It was the first time I have ever had creme fraiche. I could never eat this stuff on its own, it packs quite a tangy punch for me, but it was perfect with these pancakes. To Valli Little, the creator of these pancakes – YOU ROCK! Have an indulgent breakfast or brunch with these coconut pancakes drizzled in caramel sauce, dolloped with sweetened creme fraiche and adorned with sliced bananas. For caramel sauce, stir all ingredients in a pan over low heat to dissolve sugar, then simmer for 5 minutes, until thickened. Set aside. For pancakes, place egg yolks, coconut milk and a pinch of salt in a bowl and whisk until combined. Gently fold in the sifted flour and baking powder. Mash 1 banana and fold in to combine. In another bowl, whisk egg whites to stiff peaks, then fold into the batter. Heat a non-stick frypan over medium-low heat and brush with butter. Using a heaped tablespoon of batter for each pancake, add 3-4 spoonfuls to pan and cook for 2-3 minutes each side until golden and cooked. Keep warm, while continuing with the remaining batter to make a total of 9 pancakes. Slice remaining bananas. 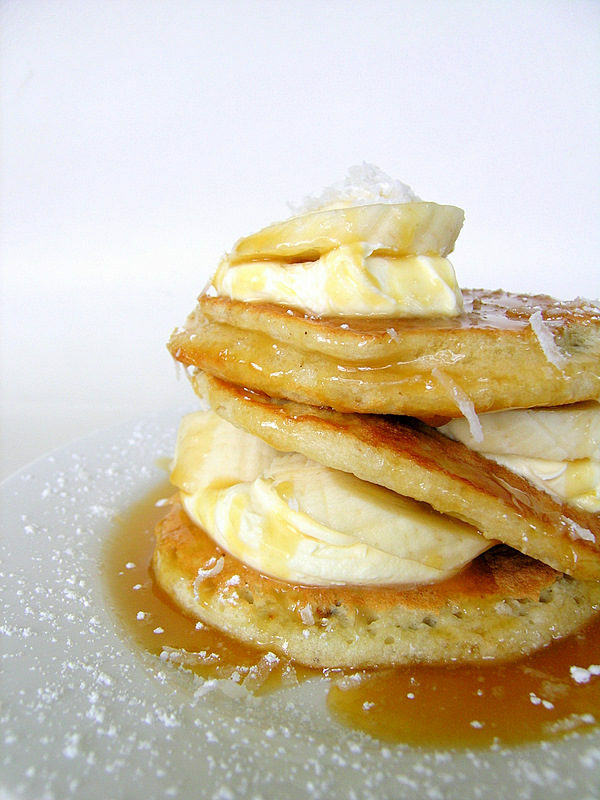 Arrange the pancakes in stacks on serving plates, alternating with banana slices and creme fraiche. Drizzle with caramel sauce, then dust with icing sugar and sprinkle with coconut. amazingly sinfully delicious! will definitely bookmark these to make! These look way better than any stack of pancakes I’ve ever had! Total eye candy and even better because they sound like they taste amazing! I must say these look AMAZING!!!! And by the way, your pictures looked much better to me than the magazine. Honestly, the mag pictures make the pancakes look burnt and not fluffy but floppy. GREAT JOB!!! Umm….yes! I love pancakes, especially special ones! The flavor combination sounds AMAZING! Thank you for including the recipe. I really, really want these right no! No wonder you wanted to make them….they look fantastic, mouthwatering!!! brilliant! need I say more? coconut is one of my all-time favorite flavors! Hello! We made these just now. They are still warm in fact and I will be grabbing one more in a minute! Thank you for the idea. I added some cardamom, not much, which enhanced the flavours. Perhaps your coconut milk is thinner than ours (I used tinned, any standard brand sold in Ottawa, Ontario, which is quite thick). I had to add 1/2 cup extra cows’ milk to get a thin-enough batter, but then they were great (I also used only 3 eggs, as I don’t like ‘eggy’ tasting cakes). Yum! Will be making again.